The Jews are desperate to leave Germany – but no country will take them. Hitler has his sights set on Czechoslovakia – and no country will stop him. We often hear the phrase, “You don’t know what tomorrow holds.” After reading this book and re-living the reality that many people faced in the events leading up to World War II, all I can say is…that phrase is so true. One moment, everyday people like you and me were happily living their lives in pre-WWII Europe, and then the next moment their world was turned upside down…and it wasn’t just the Jews Hitler was after. In Munich Signature, Murphy, Eliza, Anna and Theo had to leave Czechoslovakia. Why? Weren’t they safe from Hitler there? No. The truth was, Hitler wasn’t satisfied with ruling Germany alone…nor Austria. He wanted it all and Czechoslovakia was his next target. While all of this was going on, the Jews were doing their best to leave Germany. Desperate, some spent the little resources they had for passage on what history called ghost ships. The Darien was such a ship, and it just so happens to be one of the main focuses of the storyline in Munich Signature. We are introduced to those on board the Darien for two purposes, 1) Shimon (Leah’s husband) ends up on this ship and 2) Murphy meets a lady named Mrs. Rosenfelt on his way to America, and her grandchildren were on that ship. What is the definition of a ghost ship, like the Darien? They were called this because they left Germany with no official destination. Immigration quotas were full in every country, and no nation was allowing Jews to cross their borders. Therefore, the ship is stranded on the open waters. The Darien first sailed to London, but was refused to even enter the harbor for fear that people would attempt to jump off the boat and swim to land. Then it sailed to New York, where, by the mercy of God they were allowed to dock and receive supplies, but not disembark. Cuba was to be the next destination, but alas, you’ll have to read the story to see how that one turned out… After spending 396 pages with the little family of Mrs. Rosenfelt, you will begin to understand the desperation and hope families like these put into these ships. They hoped desperately for a nation to show compassion, and I guess that’s the hard part to swallow about this time in world history…no one did. No one. Yet, there they were, families – good people – abandoned, with no one who considered that their lives had any value. Though the Darien wasn’t the sole topic of the book, it was another example of how Jews suffered at the hand of Hitler, and unfortunately, the nations that didn’t want to help them. In addition to that part of the storyline, the book also followed the lives of our favorite characters from the previous books and introduced us to new ones. Here, I should probably admit, that there were two characters from the previous books who breathed their last in this book…and I was so glad they did! Sporer, a high up in Hitler’s terrorist club, was executed by the Czech government for an attempt at assassinating their president. (The attempted assassination all happened in the last book.) Never had I felt so relieved when a bad guy bit the dust! Just the thought of that guy roaming free in Europe to work Hitler’s evil gave me goosebumps! Then, there’s George Wand. George was sent to murder Eliza, so he’s naturally someone we’re going to dislike. He almost succeeded, but by a sacrificial act of courage from Thomas, Wand was shot instead of Eliza. If anything could redeem Thomas from his original rejection of Eliza, then that scene was it. I won’t spoil it for you, because it’s too good not to be read as part of the story as a whole. With these bad guys out of the way, surely the danger was past…right? We’ll have to wait until the next book, Jerusalem Interlude, to find out! Conclusion: The fate of a whole nation was decided by one signature on a piece of paper in Munich. That paper gave Hitler the right to step into Czechoslovakia…and all the nations of the world sat by and watched. America was too burdened by the struggles of the Great Depression to take on another country’s problem. England thought they were far enough away that such problems wouldn’t reach them, and the list goes on… The sobering fact, as Murphy pointed out to an opinionated cab driver in London, was that Germany was only a 20 minute flight from England. Of course, this makes England just as vulnerable to Hitler’s air force as any other country, but the sad part? The English couldn’t see that yet. Wow. What a lesson. The thing I learned the most from this book is simply that when evil is in power, no one is safe. No one. You think you’d be okay in Germany if you weren’t Jewish? Nope. Not so lucky! Charles Kronenberger was German. German! And still the Reich was out to end his life, even though he was just a child. 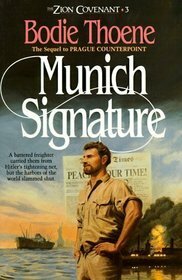 (See my review of Prague Counterpoint to see how this fits —>) In the end, Hitler succeeded and no one thought that his random power hungry streaks would ever bother them. If Munich Signature will teach you anything, it is this – don’t ever say, “That will never bother you.” If a problem is allowed to grow continually with no accountability, it will eventually take over. Interest in WWII, how Hitler invaded Czechoslovakia, how immigration quotas stopped other nations from helping Jews, ghost ships.